The Seychellois is a rare breed of cat in the Oriental group. It originated in the U.K. in the 1980s, when breeder Patricia Turner of Scintilia cattery wanted to recreate the coat patterns of cats in the Seychelles that she had read about. She did this by breeding bicolor Persians to Siamese and Orientals, resulting in pointed cats with white. (The better known pointed cat with white is the Snowshoe.) Thus far, the Fédération Internationale Féline (FIFe) is the only major cat registry to recognize this breed. 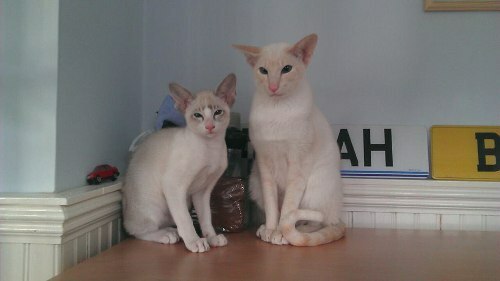 FIFe considers both Balinese and Siamese cats with white patches Seychellois. The white patches, or Van pattern, is caused by the piebald gene. There is variation in how much white is produced by this gene, graded from 1 – 10 with 1 being almost solid black and 10 almost solid white. The degree of white-spotting for the Seychellois can fall into grades 7, 8, or 9. Seychellois Septième (French for 7th) is white with a colored tail and large patches of color on the head, body, and legs. Seychellois Huitième (French for 8th) is white with a colored tail and small patches of color on the head and legs only. Seychellois Neuvième (French for 9th) is white with a colored tail and small patches of color on just the head. Other physical characteristics and temperament are very similar to modern type Siamese cats–blue eyes, wedge-shaped heads with large ears, elongated, slender, athletic, intelligent, curious, people-oriented, and playful. They do tend to be less vocal with softer voices than Siamese. Because this breed is new and only recognized by one major European cat association, the Seychellois are still largely restricted to Europe and the U.K. FIFe granted championship status to the Seychellois in 2005 and breeders with GCCF are working toward championship status as well. Fiona Whitie has graciously allowed us to showcase her beautiful Seal Tabby Point Seychellois, Mishka, along with Apricot Point Siamese, Marley.